G como en genio? La última versión de la serie Motorola-G se anuncia con confianza y se presenta como un avance exitoso de los Moto G5. Se supone que un SoC más rápido, una cámara dual y un diseño actualizado atraen clientes. Puede conocer las cualidades y debilidades del teléfono inteligente Moto en esta prueba. El Motorola moto g6 es un dispositivo que te encajará perfectamente si no eres un heavy users y quieres un terminal para un uso básico. Si no tienes pensado jugar ni llevar a cabo tareas pesadas, el moto g6 te servirá bien. [Ventajas & Desventajas] Motorola Moto G6, ¿Vale la pena? Cerramos esta recopilación de las ventajas y desventajas del Moto G6 o bien de sus pros y sus contras diciendo que es un terminal cuyos pros superan ampliamente sus contras. Dice un viejo refrán que “quien se viste de verde, con su belleza se atreve” y, tal vez por eso, Motorola ha optado por un color llamativo, veraniego y osado para identificar el último modelo que ha sacado al mercado y que presenta batalla no sólo en diseño y calidad, sino también en precio. El Motorola Moto G6 es muy recomendable, incluso para el público que busca un Android que le dé todas las garantías, no solo de fabricación. Por el precio, 249 euros en su versión más modesta (la que he analizado), hay pocos móviles que se mantengan a la altura. Incluso de coste superior. En todos los apartados cumple bien o destaca, con pegas que son mínimas y no suponen un impedimento importante para disfrutar de una experiencia de usuario buena. El Motorola Moto G6 ya está a la venta en España por unos 250 euros. El detalle del precio es la característica más interesante si consideramos las prestaciones del terminal. The G-series is Moto’s best-selling line and it really isn’t hard to see why. Whereas the brand’s higher-tier devices don’t do enough to stand out against the competition from Apple, Samsung and others, the G6 really does offer a tempting package. Don’t come here expecting a device that completely rewrites your expectations of what a £220 phone can do, but do expect one that will perform the majority of tasks you’d carry out on a phone with ease. The Moto G6 may not feel or run like a flagship phone, but it’s not pretending to be one. The G6 offers a lot of solid features, plus extras including some fun camera features, fast charging and it all adds up to make one of the best budget handsets on the market. The Moto G6 is a sublime value, despite its minimal drawbacks. The Motorola Moto G6 has a near-stock version of Android Oreo, good dual-rear cameras, fast charging and a sleek design. And it's amazingly affordable. Despite costing just £220, this phone packs in everything expect of a phone that's twice the price. It's all worth checking out to see what features you like. We're big fans of the way the app makes all these extras nicely accessible, rather than simply having them hidden away in the settings menu where you might never find them. We really admire the Moto G series of phones. In fact, it's one of our favorite models year in and year out. The 2018 is exactly what we had hoped for, meaning it's a lot of handset for the money.As much as it makes sense to see flagships and big-budget phones across multiple carriers, we'd appreciate having these there, too. Understanding that a lot of pre-paid and second-tier service providers offer the Moto G6, we think it would be well-received at the bigger carriers.We're only too happy to evangelize the phone. Nevertheless, the Motorola G6 is certainly a good place to start when looking for a phone that can not only handle the essentials but take a decent photo as well. It might not be waterproof, but a water repellent coating is better than nothing and the G6 looks and feels much more expensive than it really is. You get a decent 18:9 screen, fingerprint scanner, dual cameras and decent battery life to boot. 3GB of RAM and 32GB of storage won't be enough for everyone but you can upgrade for just £20 with the Amazon model. The standard G6 really does strike the best balance here. And for $250, it’s hard to complain about the shortcomings it does have. If anything, it’s given me more reason to complain about the flaws on my $649 phone. As the quality gap between high- and low-end smartphones continues to shrink, the price between them seems to be growing bigger. For people who usually buy top-of-the-line phones, that’s bad news. But if you’re shopping under $300, Motorola makes it feel like there’s very little you’re missing out on. The Motorola Moto G6 has a near-stock version of Android Oreo, good dual-rear cameras, fast charging and a sleek design. And it's amazingly affordable. The battery life is not as long as last year's Moto G5 or G5 Plus. The Moto G6 is a sublime value, despite its minimal drawbacks. Suffice to say, I was pretty impressed with the Moto G6 and reckon it's the best budget smartphone I've used so far this year. I have no trouble recommending it to anyone after a new phone on a limited budget. Motorola says it’s ‘designed to impress’- and it does. The Moto G6 has risen to the competition and taken the lead again. 80% Moto G6 Review: G for Glassy! It is a tough field. We have seen the Moto G series hold its own in the past, fighting mainly on the experience it delivered. This time, that does not seem to be an option, as there are definite alternatives, The Moto G6, however, seems to be fighting on another front – design. And there it is in a zone of one. The G in the latest Moto G definitely stands for glassy. How much users value it could well determine its fate. Overall, the Moto G6 is a worthy competitor to budget dominant Xiaomi Redmi Note 5 pro. The G6 ticks all the right box that we expect from a budget smartphone. Priced at Rs 13,999 for the 3GB RAM variant and Rs 15,999 for the 4GB RAM variant, the Moto G6 offers good design and build, a great pair of cameras, stock Android experience, and good performance. But when it comes to hardware to pricing ratio, Moto G6 definitely seems overpriced with Snapdragon 450 when we have most of the devices in the sub 15k price segment running on Snapdragon 6XX series. But having used the Moto G6 for quite some time, we can say that it provides a good overall experience if you are not really worried about the processor. For the price Motorola is asking for, it seems to be a little on the higher side if compared to the Chinese rivals like the Xiaomi Redmi Note 5. However, considering the design, the build quality, and the major changes in the design aesthetics from its predecessor, the Moto G6 could be a worthy contender at least for the way it looks. The Moto G6 is a good smartphone available at a decent price. But with competitors using better chipsets at the same price range, they might lose some sales from smartphone enthusiasts moving to different brands. Even still, the Snapdragon 450 isn’t bad at all. The RAM options are 3GB and 4GB. Simple users can pick up the 3GB RAM version while people who want to game on the phone can easily go for the 4GB version. Moto G6 is clearly a big upgrade over the predecessor in terms of design and specifications. Apart from a contemporary design, Moto G6 also delivers a rather fluid user experience, giving it an edge over this rather monotonous category of phones. But things like the camera performance and a price tag of Rs 16,999 (for the top-end model) keeps it from being a perfect all-rounder. Motorola Moto G6 is a well-made phone and without the doubt, one of the best-looking devices in the mid-end segment. It delivers on a number of promises made by the company – 18:9 aspect ratio display, design, dual cameras, and battery. However, it could have a beefier processor, something I’d like to point it out clearly in the review. Motorola Moto G6 competes with the likes of Xiaomi Redmi Note 5 Pro, Asus ZenFone Max Pro 1, and Nokia 6.1. Overall, the Moto G6 is a good upgrade to the last year’s Moto G5 offering an eye-catching design with good build quality, and dedicated SIM and microSD slots instead of hybrid slot. However, the camera is not impressive and the battery life it just average compared to other competitors in the price range. The company could have used Snapdragon 630 or even 625 SoC for a better performance. Overall, I like the Moto G6 as much as last year’s G5 Plus. The modern touches, like an 18:9 screen, USB-Type C, dual-camera system and slicker design mostly make up for the occasional performance hiccups. If only Motorola threw in a Snapdragon 630 instead and didn’t ax NFC, we’d really have something special. The Moto G6 looks absolutely stunning, is compact and easy to hold with one hand, and offers good battery life. Performance is decent, and the display has accurate colours but is difficult to use in bright sunlight. That said, the cameras are distinctly average, and face recognition is slow and inaccurate. The Moto G6 is a very decent all-around package barely lacking anything. Lenovo's put a very good screen and chip inside the G6, the dual-camera is capable of what it's advertised, as is the selfie snapper. Buy it. The Moto G6 combines swift performance and quality design in a bargain package that gives the lower-cost Honor 7X a run for its money. And because this phone is compatible with all networks, the G6 is a great option for just about anyone. The Moto G6 looks great and scores full marks on the design front. But overall, there is a mixed feeling about the Moto G6. The display quality is decent while the battery life is just average. On the performance front, Snapdragon 450 processor doesn’t excite much but the phone manages to be lag-free under stress. The dual-lens camera module has certainly improved. The device offers great images in good lighting conditions but low-lighting photography seems to be a weakness. Having said that the device scores big on the software front. The promise of regular software updates is also an added bonus. So, if you are looking for a good-looking smartphone with decent performance, then the all-new Moto G6 can be a good choice for you. Else, there are competitors like the Xiaomi Redmi Note 5 Pro, Samsung Galaxy J6 (2018), Asus Zenfone Max Pro M1 and the Honor 9 Lite. The all-glass design of the Moto G6 is stunning to look at and is perhaps the best-looking phone in the segment by miles. If you don't mind some of the typical Moto G drawbacks and are looking for a phone that is aesthetically gorgeous along with a stock Android Oreo experience, the Moto G6 is the one for you. For everything else, the Redmi Note 5 Pro makes a lot more sense. The Moto G6 is a stark departure from the ethos the Moto G lineup of phones stood for. It's a start of a new era where the Moto G6 looks the part of a high-performing high-end smartphone. But once you get past the shiny, new design, it’s essentially an entry-level performer with a sluggish camera. The Moto G6 Play is cheaper still at only £169 and will be found with EE, Argos, Carphone Warehouse, O2, Amazon, Tesco, and John Lewis, amongst others. The Moto G6 Plus is priced at £269 and begins as a Carphone Warehouse exclusive in the UK. The Motorola Moto G6 is more of the same for the series. But when that means a great value phone that makes almost all the right design choices, that’s only a good thing. The Motorola Moto G6 represents a quantum shift for the series, moving the once affordable phone into a more premium space. That comes with a slightly inflated price tag, but it feels like the right move for the brand. The Moto G6 is another great entry in Motorola’s value-packed smartphone family. That sleek redesign gets a big thumbs up from us, while the vanilla Android experience is backed by some worthy Moto features. And while the performance is limited, this handset will prove perfectly satisfying to most everyday users. The Moto G6 is showing a lot of promise, and has the potential to really pick up and run with its heritage of offering a ton of bang for your buck. More than most previous Moto G handsets, the Moto G6 appears to be an enticing prospect for a mass audience with a highly competitive and affordable price point, while also offering features that until now have largely been the territory of flagship-class smartphones. Despite a modest internal hardware spec, the Motorola Moto G6 offers one of the most affordably attractive and - crucially - modern smartphone packages on the market today. An all-glass build, sharp 18:9 aspect ratio screen, and full-featured camera system with AI tech simply make it easy to forget that you're using a device that costs under a third of the price of an Android flagship. If you're shopping on a budget, it's incredibly easy to recommend. While most people will gravitate towards the cheaper G6 Play or larger G6 Plus, I think it’s the Moto G6 that hits the sweet spot between price and features. This is a phone that looks great and comes packed with goodies. It all comes down to the camera, though, and we’ll need to test that further, so check out our full review soon. The Motorola Moto G6 represents a quantum shift for the series, moving the once affordable phone into a more premium space. While that might alienate those seeking a truly budget phone, visually speaking the G6 has got a whole lot right. After 24 hours with the Moto G6 you can colour us impressed. At just £219, Motorola is offering what looks to be a fantastic phone in terms of combining design, specs and software. At first sight everything seems to add up for the Moto G6. Everything you’d expect from an affordable phone is here, plus a whole lot more, with an 18:9 display, high-end design and new camera features that look to blow other affordable handsets away. 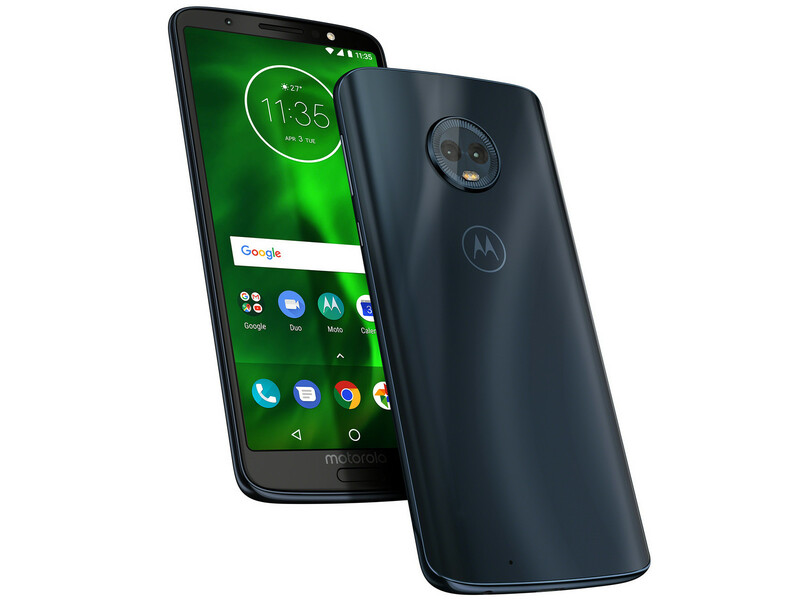 Motorola wants to keep up its momentum for budget phones in a big way, with three new Moto G6 phones for 2018 in the Moto G6, Moto G6 Plus and G6 Play. There's also the even-more-budget Moto E5 Plus, Moto E5 Play and Moto E5. Surprisingly, the Moto G6 Play is no major downgrade as well. Despite a different bill of materials, Motorola managed to preserve the styling mostly intact, in no small part, thanks to a 5.7-inch, Max View display, on the cheap. Plus, the Play manages to bring a treat of its own to the table, namely a large 4,000 mAh battery pack. Also, an on-screen navigation setup, with a fingerprint reader around back - a throwback to Moto G phones of yore. 80% Test du Moto G6 : Motorola frappe fort ! 0.167 kg: Este peso es típico de smartphones. 81.72%: Esta evaluación es para ser considerada como promedio, porque la cantidad de portátiles con mejores evaluaciones es casi la misma que la cantidad con evaluaciones peores.